Overview - Django is a lone stranger who roams the West dragging a coffin filled with chaos towards a destiny ruled by vengeance. Co-writer/director Sergio Corbucci packs his landmark classic with indelible images, unforgettable performances and some of the most shocking brutality of any 'Spaghetti Western' ever made. This is the still-controversial epic that defined a genre, launched a phenomenon and inspired over 50 unofficial sequels. When the term "Italian western," or as it's more affectionately known "Spaghetti western," is mentioned, the majority of movie fans think Sergio Leone and Clint Eastwood. And while Leone is hugely responsible for making the genre the influential success we know today, we mustn't forget the other directors working around the same time. Filmmakers like Ferdinando Baldi, Sergio Sollima, Enzo G. Castellari, Gianfranco Parolini, and even Lucio Fulci are well-known directors of some terrific and memorable films from this exploitation/cult subgenre. Amongst them, Sergio Corbucci is another prominent and important name - one deserving of the same level of recognition as Leone and Peckinpah. And while 'The Great Silence' remains his pièce de résistance, 'Django' is remembered alongside as primo gritty, ultra-violent Italian western drama. This classic of the genre commences with a stranger, who later calls himself Django (Franco Nero), dragging a wooden coffin across a desert plain. Soon, he comes across some banditos viciously whipping a young woman named Maria (Loredana Nusciak). Another gang with red hoods suddenly shows up, killing the first group and about to murder the woman. Django finally steps in by shooting all five men in an instant and saving the distraught Maria. Together, Django and Maria travel to the nearest township. At the saloon managed by the portly Nataniele (Ángel Álvarez), the lone gunslinger learns of the feuding war between the red-hooded gang led by Major Jackson (Eduardo Fajardo) and a group of Mexican outlaws led by General Hugo Rodriguez (José Bódalo). As the solitary stranger tries to make money from the violence, things begin to escalate and backfire, leaving him to fend for himself. In the same way Leone ushered in a new vision of the Wild West both poetic and demythologizing, the opening sequence of 'Django' signaled a departure from Hollywood conventions and formula. Our would-be hero doesn't ride into town atop his trusted steed and save the locals from a violent posse of ruthless outlaws. Instead, we see the title character in sharp contrast to everything we've come to know about the genre, epitomizing the traits of the antihero by wearing dark, dirty attire and walking on foot. The man is much more menacing than valiant as he pulls a wooden coffin behind him, the ultimate reminder of one's mortality. Immediately, we know Django is the bringer of death. Even the colorless, muddy town he visits is the antithesis of the American image of the West. Contrary to the sterilized and romanticized idea of this unique period in U.S. history, the town is a desolate grimy place on the verge of becoming a ghost town. Essentially, Corbucci's 'Django' is a loose reimagining of Akira Kurosawa's 'Yojimbo,' much like Leone's 'Fistful of Dollars' is an unofficial remake of the same classic samurai film also inspired by American westerns. Only, this director, taking co-writer credit along with his brother Bruno, sets his tale in a place that feels even more despondent and godforsaken. While the script is incredibly compact and straightforward, Corbucci's eye for detail is rich in the swagger, grandeur, and spectacle commonly associated with Italian westerns, encompassing his characters with a thick air of machismo and bravado which at times exceeds even Leone's Dollars Trilogy. All that is left for the star Franco Nero to do is walk confidently into a room and stare at the camera with his piercing blue eyes (much like Eastwood). The film is emanating with a distinctive charisma that places Corbucci's style in a degree all its own, despite employing many of the same camera techniques now seen as emblematic of the subgenre. With its themes - or better yet, social critiques - about racism and religious fanaticism, 'Django' is a brilliant motion picture that has gone on to influence many of today's filmmakers. From movies like Tarantino's 'Reservoir Dogs' and Miike's 'Sukiyaki Western Django' paying homage to some memorable scenes, to George Lucas borrowing the name in 'Attack of the Clones,' the film has earned its place in the world of cinema. In spite of its B-film origins and a favorite amongst exploitation/cult film enthusiasts, 'Django' deserves the recognition as a leading example of the Italian western genre . . . and as one the coolest movies ever! According to a title card at the start of the film, Blue Underground techs used the best available original camera negative for this Blu-ray version of 'Django.' While the 1080p/AVC MPEG-4 encode does indeed show some age-related damage, the video presentation is fantastic, and I can't imagine the film ever looking any better. 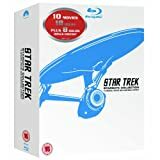 As far as I could gather, this appears to be the same remaster used for the two-disc special edition DVD from a couple of years ago, but the picture quality found here is far superior and goes beyond expectations. For those already familiar with previous releases of this classic western, the transfer is phenomenal and absolutely stunning in high definition. Presented in its original 1.66:1 aspect ratio, the intentional grain structure remains untouched and heavy as it should be, giving the film a rough, gritty appearance. Colors really benefit from the jump into the hi-def format with strong, accurate variation in the secondary hues. Reds and blues are vibrant and bold, providing the picture with a great energetic feeling and vitality. Flesh tones also appear as they should, and extreme close-ups show exceptional, life-like complexions. Blacks are lushly rendered and rich in many scenes although there are a couple of instances of minor crush in some indoor sequences. Contrast deliberately runs a tad hotter than normal, but white-washing and blowouts are never an issue. In fact, the entire image is attractively well balanced and consistently crisp with appreciable depth of field. Fine textures in the costumes and faces look splendid, and the rest of the transfer exposes many terrific architectural details. While dark, murky interiors maintain good discernible clarity of background info, daylight exteriors are gorgeous with the beautifully defined photography of desert landscapes. Overall, 'Django' looks exceptional on Blu-ray, easily outclassing previous releases and giving fans the best possible presentation of the classic Italian western. The techs at Blue Underground should be commended for their efforts in restoring Corbucci's vision to its original gritty glory. Blue Underground has also done a great job with the original sound recordings of 'Django' though it will never be anything to put someone's system to the test. The entire film is driven purely by character interaction, some limited sound effects, and Luis Enrique Bacalov's excellent score. Although they were hardly an annoyance before, the random hissing and noise pops are missing while acoustics and dynamics are sharp and nicely balanced. Despite ADR techniques being a bit more noticeable, the center channel delivers excellent dialogue reproduction and good fidelity, creating a surprisingly engaging DTS-HD mono soundtrack. Gunfights and explosions are cleanly rendered with minimal distortion or loss of clarity. It's also worth noting that techs did not alter the original track with the same artificial, modernized sounds found on the remastered release of the 'Dollars Trilogy.' In the end, 'Django' sounds exactly as it should on this hi-rez mix, and fans are sure to love it. Blue Underground completes this Blu-ray version of 'Django' with a very nice and entertaining package of special features. The film also starts with a special introduction from star Franco Nero. 'Django: The One and Only (SD, 13 min) - This pair of interviews with Franco Nero and assistant director Ruggero Deodato, who later went on to direct cult favorites 'Cannibal Holocaust' and 'Cut and Run,' are a nice treat for fans of the film and the Italian western genre. In the first half, the star talks about the origins of his name, how he was cast in the role, the film's influential legacy, and shares stories about his friendship with Sergio Corbucci. In the other part, Deodato explains not only his involvement on the production but also offers some very insightful comments about Corbucci's style and the idea of a coffin-dragging gunslinger. This is a great featurette ported over from previous releases. The Last Pistolero (SD, 10 min) - Franco Nero returns to star in this very cool short film from 2002. It's a modernized, almost retrospective look, at the subgenre with a surreal, mythological twist without dialogue. Very cool. 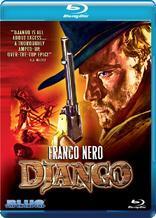 Trailer(HD) - Two theatrical previews of 'Django' are also included. In spite of its B-film origins, 'Django' is a terrific example of the conventions and devices that define the Italian western. Over the decades, the film has grown as a major influence which also spawned many copycats. Referenced in many contemporary movies, the original is still a classic and a favorite amongst followers of the subgenre. For the Blu-ray version, Blue Underground has done an extraordinary job with the video and audio presentation, giving one of the coolest movies ever another lease on life with abeautiful picture quality. While supplements are not very extensive, the package offers some enjoyable and entertaining material. Overall, fans should not hesitate on a purchase while neophytes are recommended to at least rent this classic western.